If you love Italy, I am sure you are always happy to learn new amazing things about this beautiful country. So here is a little list helping you do just that! It is light and breezy, the perfect read for when you want to both relax and entertain yourself. Plus all the information below is compiled based on my personal experiences in the bel paese. This is the second part of the list though. If you haven’t read its first 25 entries yet, click here now. Otherwise, enjoy and let me know which of the following facts surprised you the most. 26. 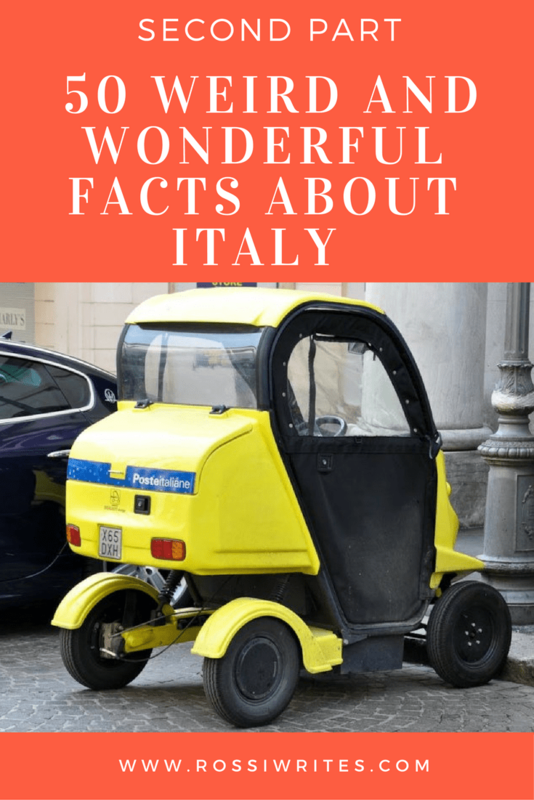 The Italian Posts use these weird and wonderful vehicles to deliver people’s mail. Called FreeDuck and made by Ducati Energia the cute little quadricycles are completely electric. I love seeing them rolling down the streets of Vicenza delivering letters and parcels. There is something so quaint and endearing about them. 27. Church bells in Italy ring a different tune according to the occasion – a wedding, a funeral or an invitation to the faithful to attend mass. Fair Verona, for example, is famous for (among other things) its bellringing art which was developed in the 18th century. 28. In memory of loved ones who have passed away, Italians affix paper obituaries to front doors and special communal notice boards. The obituaries give the name and the age of the deceased person together with their photo, the names of the mourners and details of the funeral. 29. There is a custom for Italian newlyweds to carry a sign saying ‘Oggi sposi‘ on the day of their wedding. Little posters with a picture of the happy couple under the same words meaning ‘Married today’ are also affixed to roundabouts and other places around town. 30. Small side streets often don’t have pavements. Instead, a narrow strip marked with a white line along the edge of the road is reserved for pedestrians. 31. Italy is home to the largest underground complex in Europe. The Frasassi caves in the region of Marche extend for about 30 km over eight floors. One of its rooms – Abyss Ancona – is so big that the entire Milan Cathedral can comfortably fit in it. Some of the stalagmites found in the caves can reach five meters in diameter. 32. Gelato is taken so seriously in Italy, that there is a whole University dedicated to the study and instruction of gelato making. Located in Anzola dell’Emilia, near Bologna, since 2003 the Gelato University attracts thousands of people from all over the world eager to learn how to make proper Italian gelato. Its popularity is such that the University also offers courses in 12 other countries. 33. For all its love for gelato and appreciation for its traditional artisan making techniques, Italy nowadays is not shy to sell to the unsuspecting tourist a cone of whipped with air and artificially coloured fake gelato. If you would prefer to taste the real stuff, always pay attention to two things – volume and colour. Real gelato is heavy and lies flat in its container (hence forgo the piled high mountains of gelato you will see in most tourist hot spots). Also its colour is muted, rather than bright (proper banana gelato, for example, is grey or white, so avoid the brightly coloured yellow variety). 34. Foreign films are traditionally dubbed in Italian with the same Italian voice actor used to dub the same foreign actor through its entire career. 35. The use of forks gained a footing in what nowadays is Italy before any other Western European region. By the 11th century forks were prevalent at the table in the Italian peninsula. The custom of using them was imported from Byzantium and prevailed due to the pasta-rich local diet. 36. In many Italian towns and cities you can see houses with lavishly frescoed facades. One of the most splendid examples is the Mazzanti building in Verona. But even in smaller towns like Feltre in the Italian Dolomites or Bardolino and Malcesine on the shores of Lake Garda you can come across beautiful houses with amazing frescoes which make you feel like you are walking through the most exquisite open air gallery in the world. 37. Italians dedicate a lot of time and effort to the preservation of old crafts and arts. People join organisations aiming to promote the artisan heritage of their locality. They organise festivals and events during which they dress up in medieval costumes and show to the curious public how coins used to be minted, cloth used to be woven, shoes used to be made by hand, jewellery used to be wireworked and frescoes used to be painted many centuries ago. 38. Italians (in my humble opinion) smoke a lot. It is a customary thing to see a group of teenagers drawing deeply on their cigarettes straight after school. Unfortunately, I also often see women smoking whilst out and about with their babies and toddlers, not always making sure that the exhaled smoke doesn’t hit the child straight on the face. The smoking area at Venice Marco Polo airport is right outside of the entrance doors, so as you are approaching dragging your heavy suitcase behind you and pushing your child in a buggy in front of you, expect a smoker or two to blow their smoke right at you. 39. In even-numbered years a human chess game takes place in Marostica – a charming walled town in the Northern Italian region of Veneto. The town’s main square looks like a giant chessboard and in September actors and horses take part in the lavish game. It is held in commemoration of a love rivalry which, centuries ago, pitted against each other two noblemen. They both were in thrall to the daughter of the local ruler. Wanting to prevent a bloodshed, the ruler ordered them to play a chess game instead of engaging in a duel. The winner married the lady of his heart and the loser was betrothed to her younger sister. 40. The city of Turin in Northern Italy houses the world’s second largest Egyptian museum. This is where many famous Egyptologists like Champolion (who deciphered the Egyptian hieroglyphs) have spent time researching and studying ancient artifacts. Among many amazing things, the museum owns the most ancient known copy of the Egyptian Book of the Dead (alongside with two other copies of it). 41. If you are ever in trouble in Italy (for example, you lock your keys in your car), call the emergency number 112. In the locked car keys scenario they will send a fire brigade to lower your car window and then unlock it from within. Speaking from, ahem, experience. 42. Italian men take personal grooming to a whole new level. They take meticulous care of their skin and have their manicure done when visiting the barber for a haircut. 43. The Northern Italian province Alto Adige (known as South Tyrol in English) has two official languages – Italian and German. Being there feels very much like being in Austria. Place names all over Alto Adige have two versions. For example, the capital city is called Bolzano in Italian and Bozen in German. 44. Butter sold in Italian supermarkets is not salted. This came as a bit of a surprise to my British husband. 45. The Italian peninsula was originally part of the African continental plate. Tectonic movements jammed it into Europe. This is the reason why the Italian side of the Alps is much steeper and dramatic than the French one. 46. The reason you are able to use all sorts of computer-based devices in your daily life is an Italian called Federico Faggin. Born in Vicenza he designed the first commercial microprocessor and co-founded Zilog – the first company dedicated exclusively to microprocessors. 47. Italian coffee-based drinks are about one-quarter to one-third of the size of coffee-based drinks served in London, for example. Whereas it is normal to be poured your cappuccino in something like a kid’s bucket in England, in Italy the frothy drink will arrive in a much smaller and manageable cup. Also, coffee in Italy is strong, aromatic and gives you a real kick. There is definitely no burnt taste as the one seemingly favoured by an international coffee shops chain. 48. Italians would never ever add cheese to a seafood-based pasta. 49. When you walk into a shop, an office or a waiting room, it is socially expected to greet the people there. Clerks and shop assistants will not necessarily smile at you though and may keep a very formal, serious expression all through the interaction. I don’t want to generalise, but people working in small private businesses (unless these are located in a real tourist hot spot) seem to be much more approachable and happy to help in comparison with people working in public offices and multichain businesses. A friend of mine was shouted at in a branch of the Italian Posts for having, apparently, ‘the wrong type of envelope’, whilst I was quoted a widely different postage price to the one asked from my husband for the exact same letter to England. 50. The Slow Food movement originated in Turin in Northern Italy. It is an antithesis to the fast food establishments where food has been turned into a soulless product rather than the nourishment for our souls and bodies as it should be. A Slow Fashion movement is now evolving there, too. It supports fashion which is 100% Italian and is born from the slow and meticulous work of the hands of genuine artisans. Did you enjoy reading these facts?! Or do you have a fact or two to add to the list above? !